This quote hangs outside our front door. It is a really beat up piece of wood. Our bishop was giving a talk in sacrament meeting and he read a portion of Thomas S. Monson's First Presidency Message found in the April 2006 issue of The Ensign. "It is in the home that we form our attitudes, our deeply held beliefs. It is in the home that hope is fostered or destroyed. Our homes are to be more than sanctuaries; they should also be places where God’s Spirit can dwell, where the storm stops at the door, where love reigns and peace dwells." I went home from that meeting and could not stop thinking about that, that our homes should be a place where the storms of the world are left outside. The chaos. The contention. The discord. The despair. The filth and the ungodliness. I painted this sign so all who came here would see what we are trying to stand for. But ultimately, what I really hope for, is that we are actually living it. 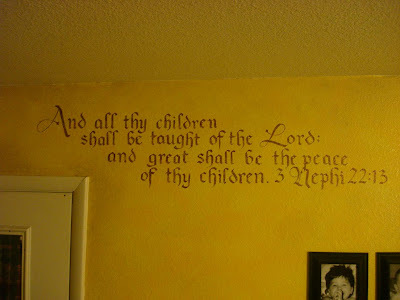 These are scriptures I painted on my bedroom walls a couple of years back. 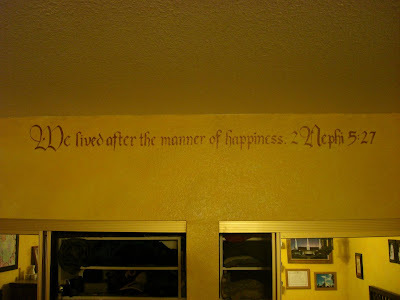 All I did was pick a font I liked on my computer, print out the scriptures, chalk them on the wall while looking at the print-outs and then use some water-based tole paints to "write" them up there. They aren't perfect, but I really like them a lot anyway. This first one is for husbands and wives. It reads, "Remember the covenant wherewith ye have covenanted one with another. D & C 90:24". In the temple we make sacred covenants with Heavenly Father and with our spouses. We don't make covenants with anyone else. Ever. I picked this scripture so that I could see it when I woke up every morning and remind myself that Rob comes first above everyone else in this mortal life. This second one is found in 3 Nephi 22:13, (also Isaiah 54:13) "And all thy children shall be taught of the Lord: and great shall be the peace of thy children." This is a commandment and a promise. I love that. It was painted near the baby photos of my 5 precious children. That's neat, and pretty too. I love to craft, create, be inspired, improvise, dream, decorate and beautify. PS- If you're here for a printable, be sure to right-click the photo and open it in a new tab to get the full size. :) You may not sell my printables, or use them for any form of personal gain.